Still not watering... - Page 3 - Orchid Board - Most Complete Orchid Forum on the web ! Wow, over half a year. Still, the pbulbs are so neat looking, that's just fine. And you're another Steve in TX. My missus is just got back from two days in Austin. I'm just hoping not to kill them! All very interesting. 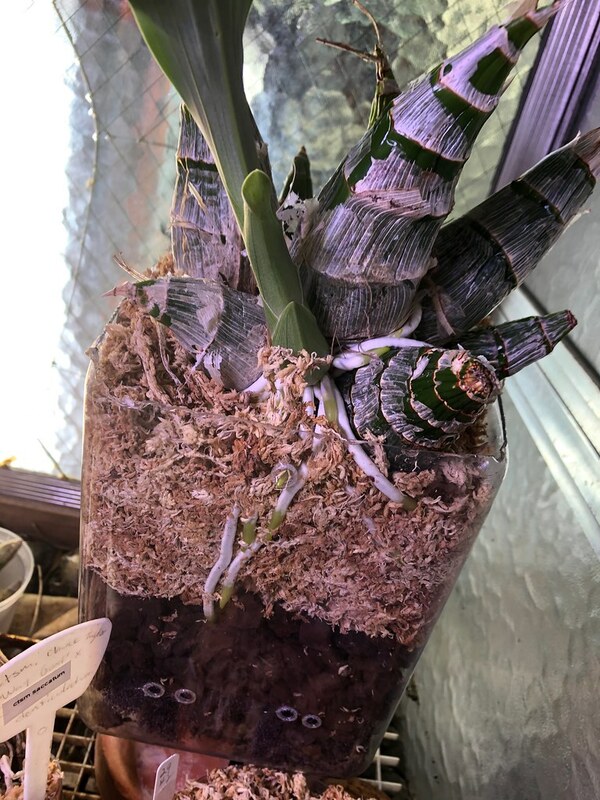 I have had a number of pBulbs throw a spike, everything nice and dry, they throw roots, and then all of a suddenan less than an inch, the roots stop growing. Then the green tips of the roots start to fade away until the roots are all white. When I water them, and pack wet moss round the roots, the roots coome back to life. Also, I had a Jumbo puff that had rot in the pBulb base. I had to cut off all the base, and treated it with cinnamon. All went good, but recently, it was still lying there on its dry moss bed, doing nothing. Eventually I snapped, wrapped it in a wet cloth, shoved it into a black plastic container and left it in the 50% full sun in the greenhouse where it started to cook. 3 days later I took it out, and lo and behold, it proceeded to throw shoots from 3 eyes. So, I put it back on the dry moss, and one of the shoots started to die. Then the second one died, and the third started to look sick, so out of desperation, I shoved it into wet moss, whereupon the shoot wen into reverse, plumped up and is throwing some roots. I mean seriously? What the heck is with that? Do you mean the growing tips come back? Or the roots turn green when wet? Tough to say! I'd be curious to see if those new roots keep growing or stop after growing about an inch. Well, I will let you know. As I say, the other pBulbs, the roots started growing again. Still not watering! The first pic shows a monstrous Clowestum Dragons Treasure with roots at least 4” long. 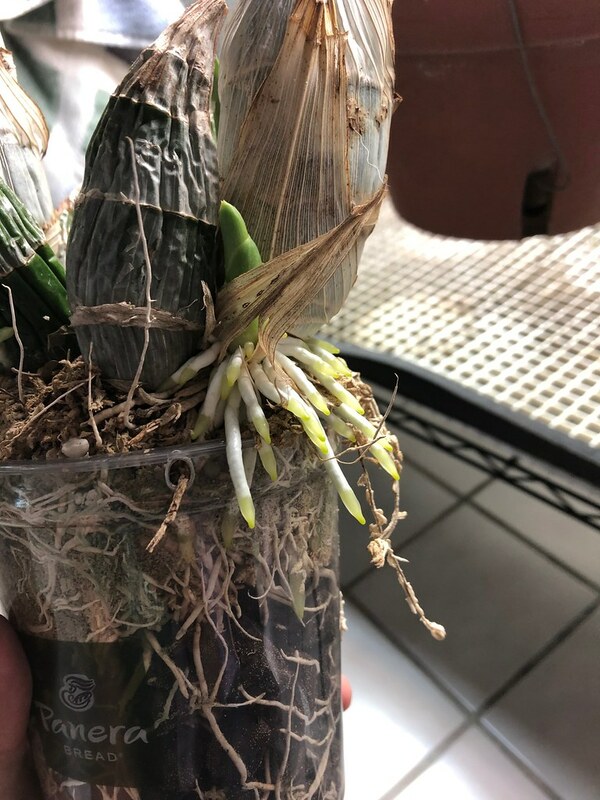 The second pic is a monstrous Clowesia Rebecca’s Daughter that I reported despite the new roots being too long. I broke a few root tips but the bulk of the roots are fine. 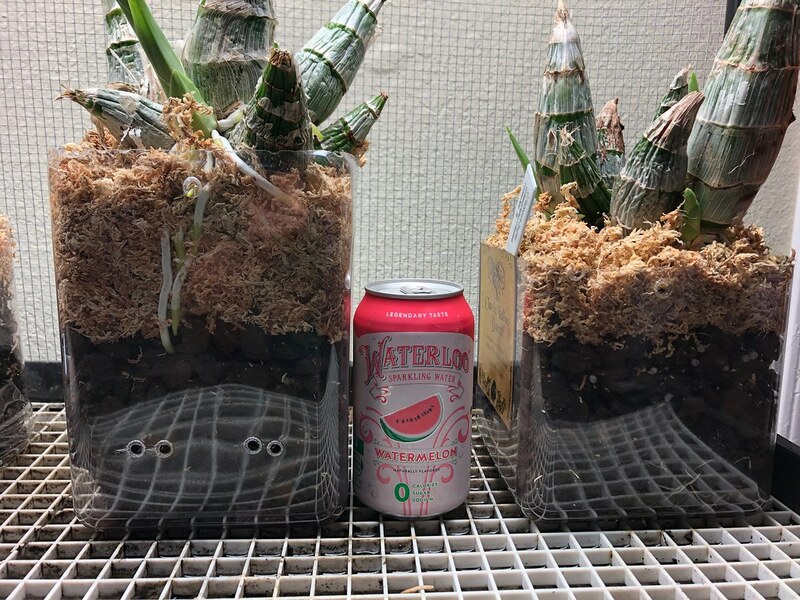 The third pic is both plants next to each other with a fizzy water can in the middle for reference.